One-Stop Shop for your Holiday Meals & Gift Giving! Think Davanni’s when you think Holiday Catering and Gift Giving this season! Davanni’s is your one-stop shop when it comes to feeding your family, friends & co-workers this Holiday Season. We’ve got the fan food that everyone craves from a variety of Pizza, Hot Hoagies, Salads, Pasta & Lasagna Pans, Calzones, Party Trays, Dessert Trays & more! You can enjoy your meal at one of our shops in our comfortable, spacious party rooms – which are FREE with a minimum food purchase. Just call & speak with a manager for availability or submit a party room inquiry form! Or let us bring the food to you, we deliver. If you have any questions or need ordering suggestions don’t hesitate to call and speak to one of our catering experts! Or, if you know what you want already you can place an online order anytime. 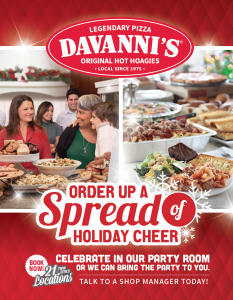 We can’t wait to make your holidays a little bit easier with Davanni’s catering! It’s back. ‘Tis the season for our Holiday Gift Card Promotion. 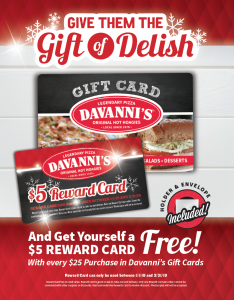 For every $25 in Davanni’s Gift Cards you purchase, you get a FREE $5 Reward Card! Reward Cards are good to use starting January 1, 2019-March 31, 2019. The perfect gift for your friends, family, and even yourself! You can order gift cards in-shop or online! Shops are closed Thanksgiving Day & Christmas Day. Shops close at 2 PM Christmas Eve. Plan ahead for your food and gifting needs this holiday season!